I'm now sitting on a small potato-like planetoid in the very end of the Monoceros Passage and uploading this log with the magic of the FTL communications. The hull of my DBX is burnt to holes in several places, but I've managed to seal part of the living compartment, so the journey may actually go on. But first things first. 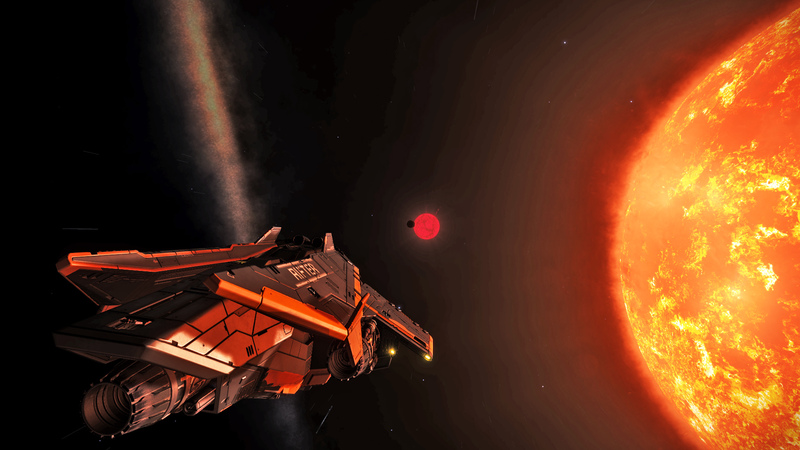 On my way to the Monoceros Passage about a week ago in Dryafiae FK-U b49-0 system I've met some really nice hot Jupiters (you might be surprised to know that this name dates back to the first gas giant discovered by the humanity in the vicinity of the Old Terra). They both are located almost inside their dwarf star's coronas and have orbital periods of only 0,2 days. The second one is a little bit colder. 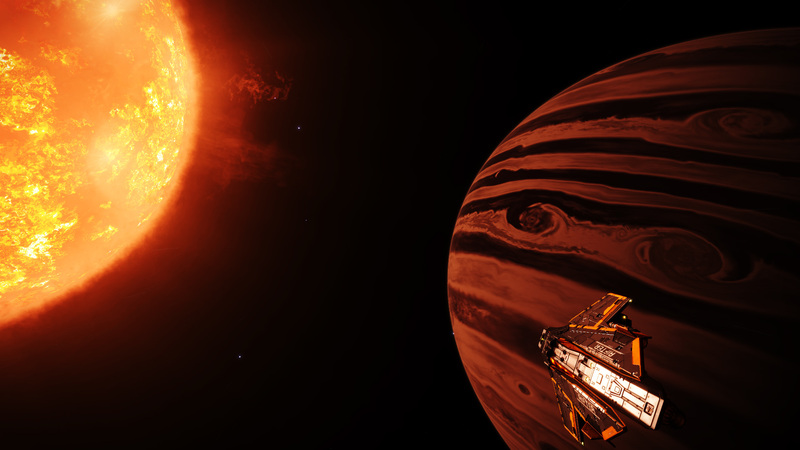 This gas giant is 24 times smaller than our Achenar VI, but, as you can see, it's parent understar brown dwarf Dryafiae FK-U b49-0 B is so small, that it's only planet can compete to it in size and mass. 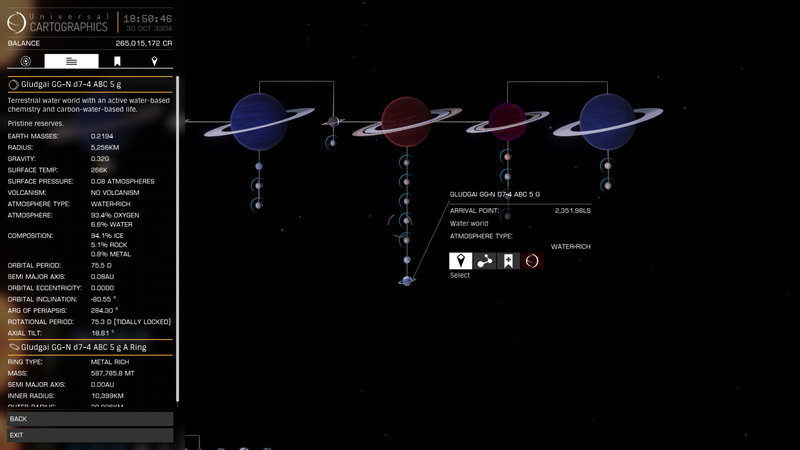 During the next part of the trip I've managed to map some notable planets. Among them is another terraformable rocky moon at DRYAA PHIO OK-C D14-2. 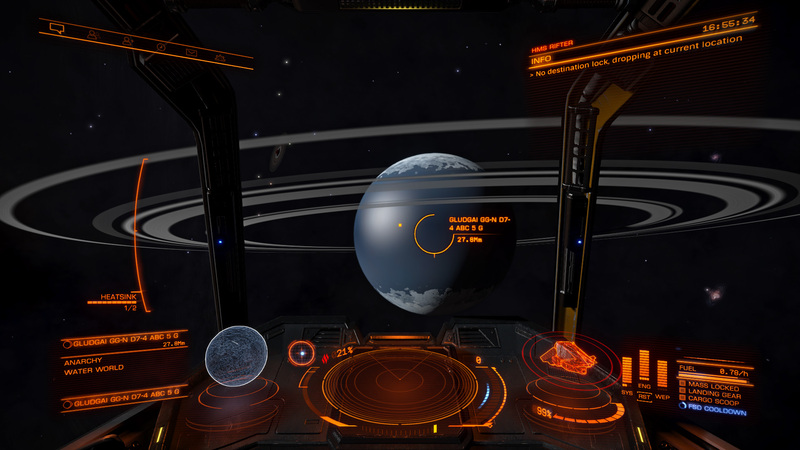 And a really nice-looking ringed waterworld Gludgai GG-N d7-4 ABC 5 G on orbit of a very large gas giant with an extended ring system. Here by the way you can see those rings spread in the background. In the meanwhile the stars were becoming more and more sparse, young T Tauri stars disappeared almost completely, the jumps were longer and longer, The Milky Way, usually (well, at least usually for us, inhabitants of the Bubble) warped all around the sky, gathered in a spot behind and the sky in front of me became coal black. 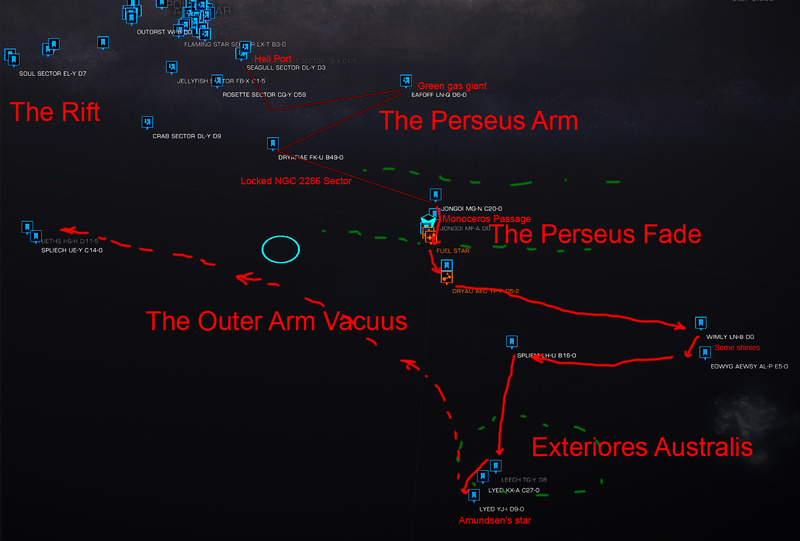 This all meant that I was closing my destination -- the Perseus Fade, the region on the on the very edge of the Perseus Arm. The GalMap says that here star density drops drastically, and that beyond the Fade lies only the intergalactic void. This is all true, but not completely. Because between the Fade and the void lies also a region named the Outer Arm Vacuus. If you look in the sky, you'll see nothing there, if you look at the map, you also would not notice any difference between the Fade and that region. Still the stars on the very tip of the Outer Arm get a tiny-tiny bit denser and ship with long jump range can still navigate in the Vacuus. And the gap between the Perseus Arm and the Outer Arm Vacuus is crossed by a single thin chain of stars -- the Monoceros Passage. Currently it is the only documented way through this part of the Perseus Fade. And still it is available only to heavily engineered ships. 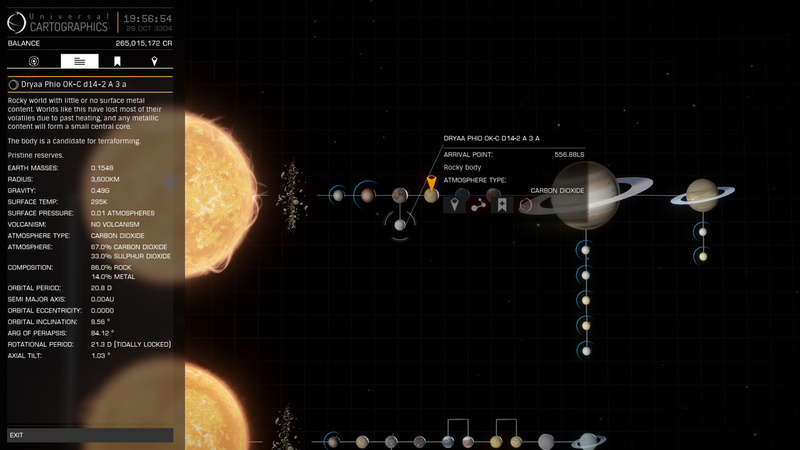 The longest gap you'll have cross here is 119,78 Ly, so the jump range of at least 60 Ly plus tons of jumponium are mandatory. This chain of stars was mapped by a group of brave explorers during the Mococeros expedition. And I can only express my admiration for them, because navigation here is difficult even with the help of beacons, left by the expedition. And they managed to find a bridge through this region without any instructions at all. It was time to draw a bit more detailed plan of this part of my journey. I decided that turning in the direction of the Rift right after crossing the Passage was just too easy. I saw one bright spot in the darkness in front of me -- a large star cluster named Exteriores Australis. It was literally at a hand's reach -- the necessary detour was only about 6 kLys, so there there was no reason not to visit it. And going there and not visiting the Amundsen's Star -- the most southern system in the Galaxy -- is just strange. So I added it to the list. The main waypoints were set, I injected the first portion of jumponium into my drive and hit the road. And what can I say. According to the Monoceros expedition report they needed jumponium 14 times during the passage. I didn't follow their route by the book, only several key waypoints, and I had to use jumponium only 8 times. And this is mainly not thanks to my navigation skill, but thanks to the fact that the jump range of my HMS Rifter is 72,16 Ly which is exactly 10,83 Ly more than the best ship of the expedition had. Jump range really matters here. Here are some shots done during the passage. 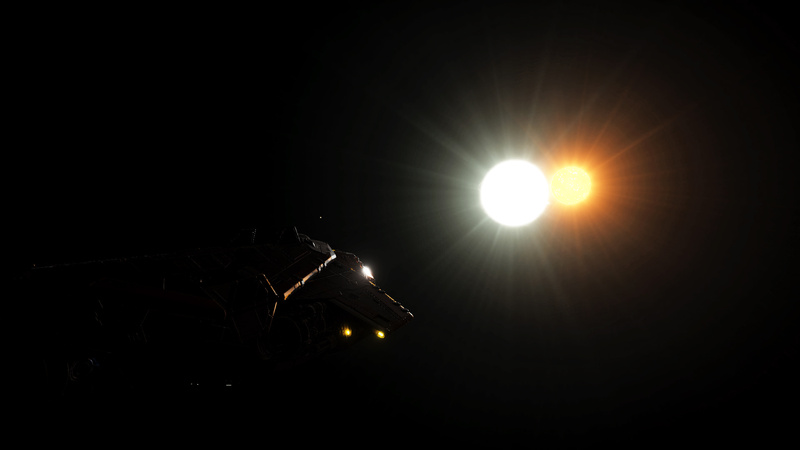 Solar eclipse in JONGOI SC-M D7-0. Siamese twins in JONGOI UR-W D1-0. Do you remember what exactly salesman told you when selling your extra-large long range engineered FSD? I bet it was something about the new jump drive technologies and super-advanced software that nowadays make life of explorer completely safe and devoid of danger of running into a star when jumping to close binaries. 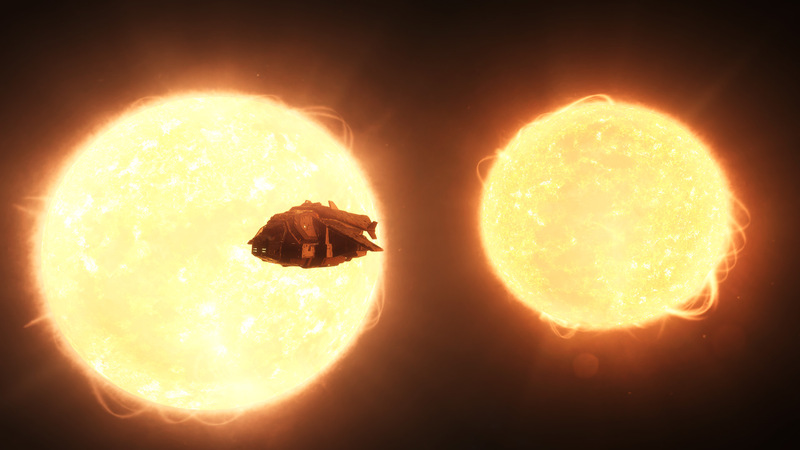 I've jumped into one of those stars (was too excited to remember which one exactly) in EORM AIP KW-E D11-0. The temperature went up like a rocket, the cockpit filled with smoke, all monitors on the panel blinked red, the siren howled and the windshield quickly covered with suspicious cracks. 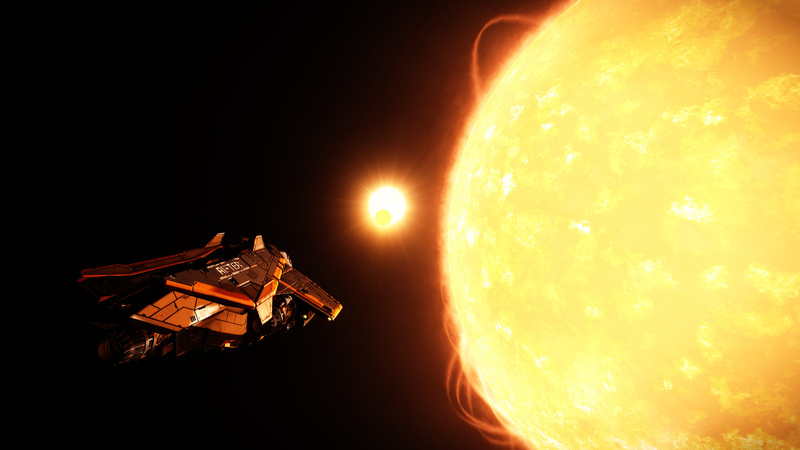 Fortunately I had enough heatsinks to not boil away completely while FSD reboots and managed get out alive. I landed on a small planetoid in a nearby system and started calculating losses. The magical nanobots from the AFMU system didn't burn up, so I ripped some metallic pieces of cabin trim and fed them. The interior now looks a bit ugly with all those hanging cables, but at least I managed to patch up most of the modules. This don't apply to the reactor, unfortunately. It now reports some strange fluctuations, so I will probably have to stop by Station X in the Crab Nebula on my way to the Rift to have some proper repairs. And of course this don't apply to the ship's hull. Because you know, this is the usual problem with DBX -- you never have enough space for those repair limpets. 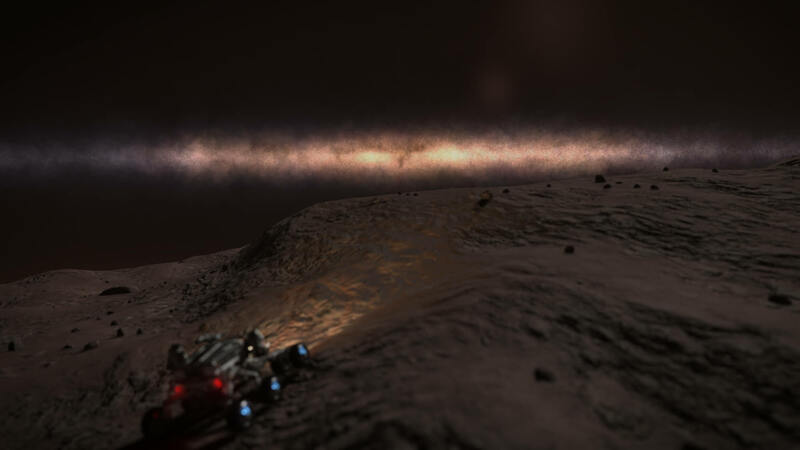 To take a break from repairs, which lasted for about two days, I made small a ride around, digged some jumponium (because Eorm Aip FQ-G d10-1 A 4 is really rich on Yttrium) and took this photo of our Galaxy seen slightly from the outside.